On Christmas Eve, I found out via Kristin Hersh on Twitter that Vic Chesnutt was in a coma – Vic’s a singer/songwriter that I’ve known about since the mid 90s (Andrew AKA Calamateur played me a compilation album of his songs called Sweet Relief II). I suggested over on my Posterous blog that if people wanted to help, they should buy his music. If he got better, he’ll have medical expenses, and if he didn’t, his wife will need money to live. As far as I knew, Vic ran his own label – certainly his website home page has ‘Vic Chesnutt – Constellation Records’ at the top of the page. (having looked at it now, it appears he didn’t own the label, but it was a small indie set-up). And after it was announced on Christmas Day that Vic hadn’t survived the coma, Kristin Hersh tweeted a link to a place to donate money. So, why did I suggest buying his music not donating, and how does it change now? In almost every situation, so long as the artist isn’t mired in some hideous major label deal where they don’t make a penny, I’d go with buying their music over making charitable donations. All the more so if the artist is still alive. Their music is the way they make a living, and where it’s possible to facilitate someone’s work paying their way, I’m all for that. If someone has music available, they shouldn’t NEED charity, they need more sales. It’s why I suggested buying music by our lovely friend Ralston Bowles when he was diagnosed with cancer and had some hefty medical bills to pay. In the case of an artist dying, buying their music makes sense because it’s their legacy. To those of us who didn’t know them, it’s how they live on. People will carry on buying Vic Chesnutt records without knowing he’s gone (I’ve bought various records by artists that have died and only found out later on), and to them his music will just be great music. For those of us who make music, the thought that our music will outlive us is a strong and heady prospect. It also means that the money is earned, not given – the listener gets something back from the artist, and also spends some other non-monetary currency stuff on them – our time, and then the opportunity to spread the word about the amazing music we’ve just discovered. Wherever there’s a win/win solution, I’m for that over win/lose or even win/neutral. Help the family and discover his music. Pass the knowledge of the music on, and it’ll grow faster than a donation. And the bigger lesson here? Don’t wait for musicians to die to either discover them or express your gratitude for their music by paying for it, thanking them for it, or spreading the word about it. Music has value, and that value can be expressed in lots of ways. We’re all trying to find ways of making the best music we can while paying the bills – a lot of that ability rests in the hands of listeners. 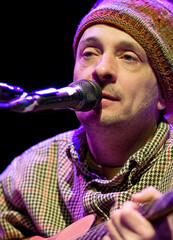 RIP Vic Chesnutt, he’ll be sadly, sadly missed.